Great Trelandon Farm, located in the Golden Valley, is one of the most beautiful and rural areas of the country. Set in over 25 acres of pastureland at the foot of the Black Mountains we consider ourselves one of the best locations for Glamping in the UK. As a small and intimate site we have six bell tents spread over two small glamping fields available for guests to come and stay. We have fantastic shower and toilet facilities together with electricity points, fridge and electric kettle for our guests convenience. The Golden Valley is an area of Hereforshire which has been featured not only by the BBC but also in several recent films. The area covers Hay on Wye down to Pontrilas in southern Herefordshire and is one of the most rural and sparsely populated areas of the country. 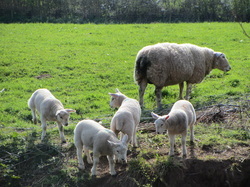 Herefordshire is predominantly an agricultural county and is well known for its fruit and cider production. Local to the Glamping site is the award winning Hopes Village Shop and two country pubs that both serve a wide selection of wood and drinks.